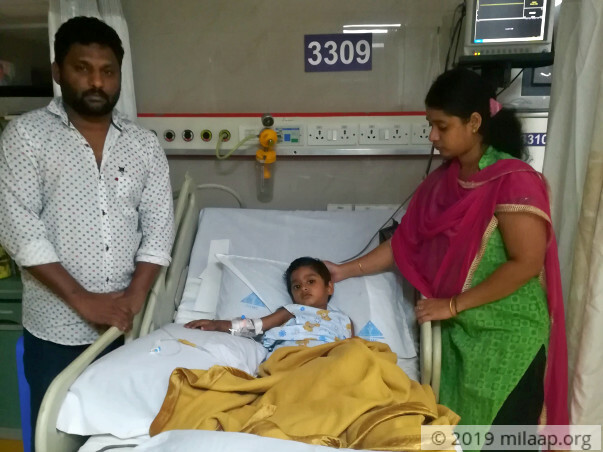 When the 3-year-old, Srisanth complained of headaches and joint pain no one could have imagined how much life was about to change. His old, playful, happy life has become a distant dream.He is suddenly attached to an array of tubes and subjected to rounds of chemotherapy and medications. 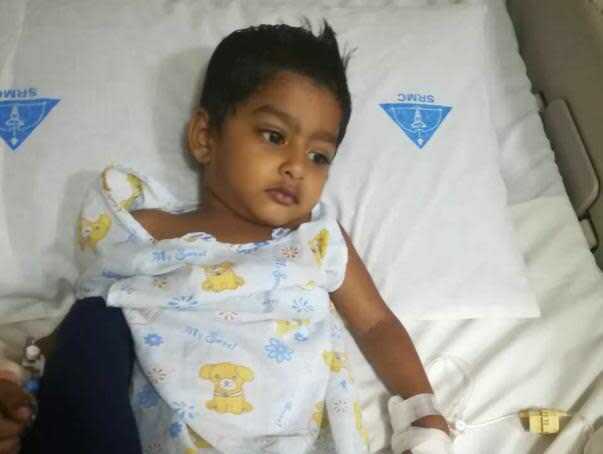 This little boy is battling a dreadful disease - cancer. Srisanth was always found playing outside his home with his friends. A month ago, his parents noticed bruises on various parts of his body. To begin with, it didn't seem to be anything to worry about. He was still active but in few days he became more tired and weak. They took him to a hospital and several tests were taken. No one can ever prepare for the pain and total devastation they feel when the doctors tell, "I'm sorry, your son has cancer!". 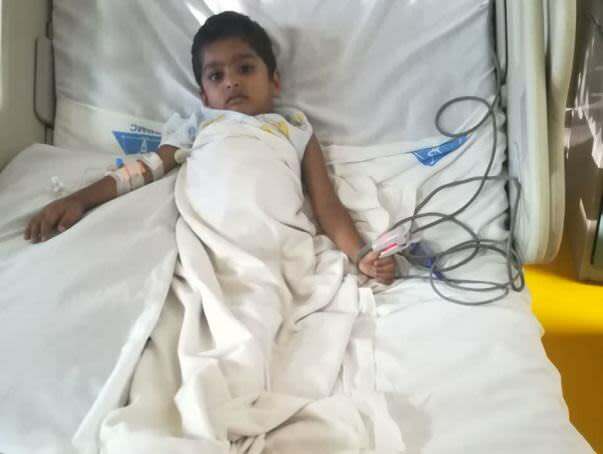 His mother Aishwarya fell to the floor, Vimal Raj stood listening to the doctor in total shock with tears rolling down his face. 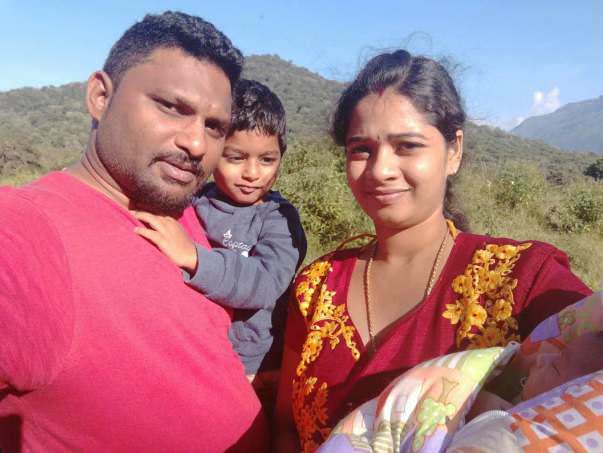 Aishwarya and Vimal Raj had a lot of dreams about his education and future. The fact that hospital will be his only word and experience that he can get for the next 3 years breaks them into pieces. With one infection went, he seems to catch another. 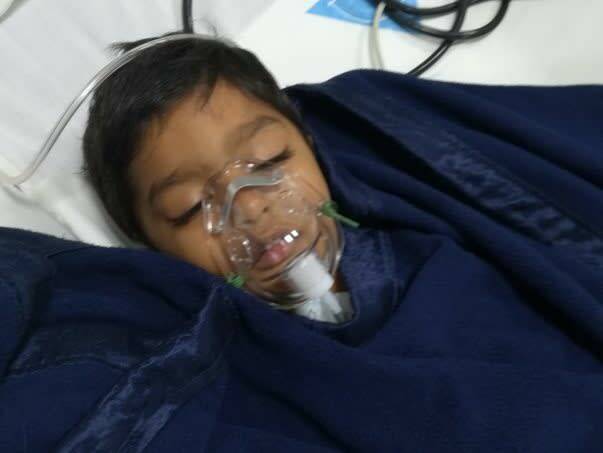 Srisanth needs chemotherapy for the next 3 years to recover completely. "Cancer is the scariest thing that one can hear, especially when it is our son who is going through that. 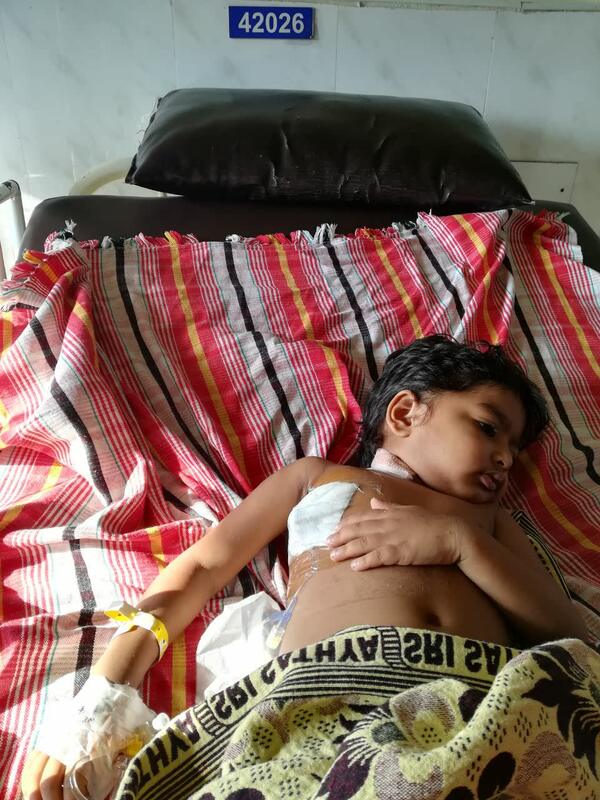 He is only 3 years old, at this young age, the connection between cancer and death is easily made. I can't get over this thought. I'm scared that I might lose him. I need to save his life at any cost." - Vimal Raj. Aishwarya gave birth to her daughter just 3 months before. She is shattered beyond words to see her son suffering in pain. Vimal is taking care of Srisanth, he cries for his mother but she is helpless. She needs to feed and take care of the baby as well and she cannot bring the baby to hospital fearing infections. Little Srisanth couldn't understand why no one is showing his little sister to him. 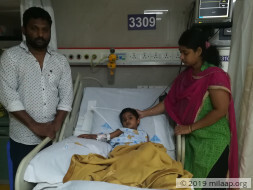 Vimal Raj and Aishwarya are from Coimbatore and they have come all the way to Chennai for the treatment. Vimal did not give a second thought about quitting his job. When doctors told that he needs intensive treatment and care for the next 3 years, considering his mental health, he decided to stay next to him. He has no source of income now, but he is determined to save his son and willing to do anything for him. 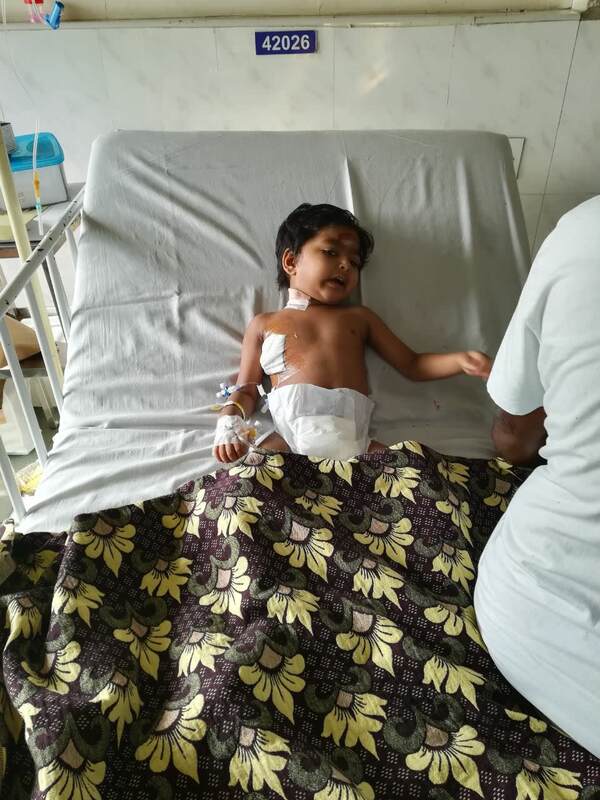 Aishwarya is worried about the pain he has to endure throughout the treatment. The hair loss, loss of control of his bladder and bowels, infections, bleeding, sickness and much more. 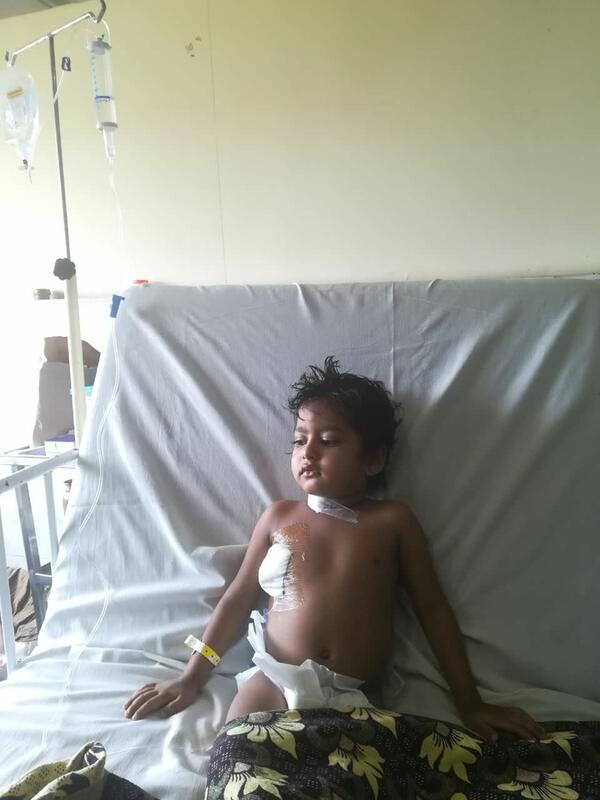 Little Srisanth is not aware of his painful journey ahead. He pleads his parents to take him back home. He can't wait to play with his sister. "Everyone else going about their daily lives, I don't even know my son would make it through the treatment. I sometimes think that I have to be honest with him, to tell him about the next 3 years but how he can take it? How long can I hide it from him? Even at this age, he could sense the anxiety in us. Our financial position is even scarier, we have exhausted everything we had. How can I let my son down? I need to save him at any cost." - Aishwarya. Vimal Raj and Aishwarya are waiting for the nightmare to get over. 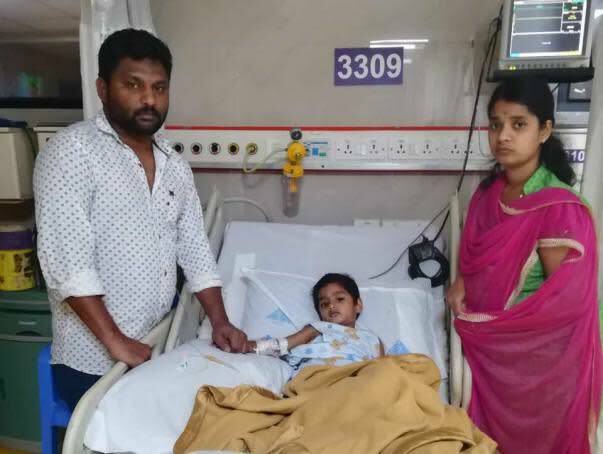 They cannot stay in the ICU so they are looking out for a room in Chennai to stay. They have no other thought but to save their son. However, they are struggling everyday even to buy tablets for him. Vimal Raj has quit his job in the bank and he has no source of income. He has spent all his savings and now relying on the strangers to help him save his son. 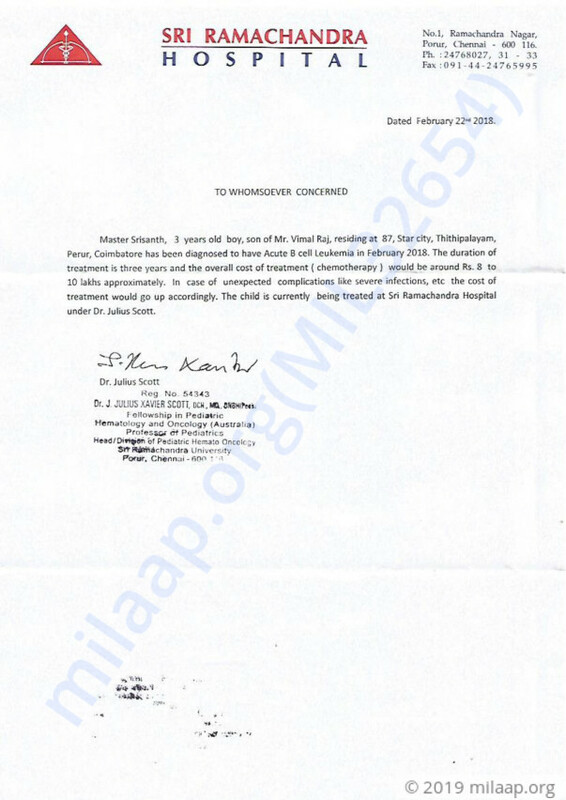 Srisanth needs chemotherapy for the next 3 years and it would cost around 10 lakhs. Only your support can save his life. Your contribution can help him to have a chance to live his life! 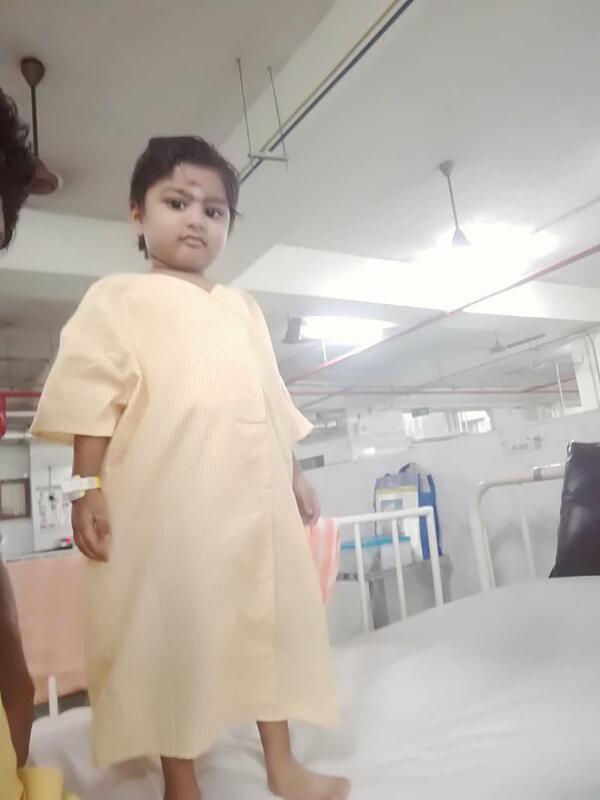 My little son, Srisanth, is showing improvement in his health now. Two cycles of chemotherapy are over and six more are left now. The doctors have told us that all chemotherapy cycles will be done with, in eight months post which he will be observed closely for the next two and a half years for any changes. He is feeling better now but also, feels tired because of such an intense treatment. We are all hoping to see our little baby recover soon and respond to the treatment well. Please keep supporting us so we can help my child live a happy life ahead. I want to take the time to sincerely thank you all for your donations to support Srisanth. As you know, we started this campaign to Blood cancer treatment , and your Rs,5,57920 contribution on March 2018 helps us get one step closer to our goal.